Recent research suggests that the basement membrane at the dermalepidermal junction of the skin plays an important role in maintaining a healthy epidermis and dermis, and repeated damage to the skin can destabilize the skin and accelerate the aging process. Skin-equivalent models are suitable for studying the reconstruction of the basement membrane and its contribution to epidermal homeostasis because they lack the basement membrane and show abnormal expression of epidermal differentiation markers. By using these models, it has been shown that reconstruction of the basement membrane is enhanced not only by supplying basement membrane components, but also by inhibiting proteinases such as urokinase and matrix metalloproteinase. Although matrix metalloproteinase inhibitors assist in the reconstruction of the basement membrane structure, their action is not sufficient to promote its functional recovery. However, heparanase inhibitors stabilize the heparan sulfate chains of perlecan (a heparan sulfate proteoglycan) and promote the regulation of heparan sulfate binding growth factors in the basement membrane. 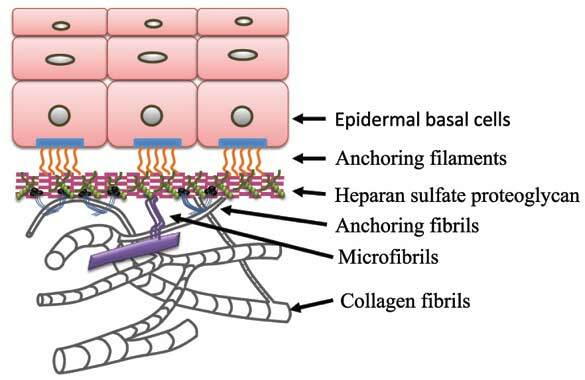 Heparan sulfate promotes effective protein-protein interactions, thereby facilitating the assembly of type VII collagen anchoring fibrils and elastin-associated microfibrils. Using both matrix metalloproteinase inhibitors and heparanase inhibitors, the basement membrane in a skinequivalent model comes close to recapitulating the structure and function of an in vivo basement membrane. Therefore, by using an appropriate dermis model and suitable protease inhibitors, it may be possible to produce skin-equivalent models that are more similar to natural skin. Basement membrane, heparan sulfate, heparanase, inhibitor, matrix metalloproteinase, three-dimensional culture. Shiseido Research Center, 2- 2-1 Hayabuchi, Tsuzuki-ku, Yokohama 224-8558, Japan.